Outdoor living spaces, particularly the patio, are becoming as decorative and comfortable as indoor living rooms. More and more people are embracing the outdoors and being able to experience the sun and breeze in your own backyard is such a huge thing. It is not enough that you bring out a comfortable chair and a book. The setting must be perfect and designed in your favor. We’re not saying that you should rebuild the whole patio. We’re just saying you can enhance the concrete patio at a fraction of the cost of a new build. There are many different ways you can enhance the patio to your liking. But first things first: what’s in it for you? It looks great! Aesthetics is an important element in an outdoor living space. Most people are visually stimulated and having attractive patio surfaces do not have to involve expensive materials like brick, natural stone, and the like. It stays strong and durable for quite some time. Just because a patio is resurfaced with a thin layer of coating or overlay, does not mean that it is less durable than a thickly poured slab. It is very easy to clean and maintain. You don’t even have to be in full cleaning gear to keep it in tip top condition. A sealer applied on top keeps it resistant to dirt and anything that can spill and make a stain. You don’t have to invest in expensive cleaning products. Water will suffice. It is an affordable option. Resurfacing or refinishing concrete patios give you all the benefits of a newly installed patio at a more affordable cost. Plus, you get to reduce carbon footprint by opting to restore your existing concrete than making use of newly manufactured cement mixes. Stamped Concrete Overlay – Are you the type that fancies a flagstone, brick, or slate patio? Then this is an affordable alternative. The newly installed overlay is stamped with your chosen design using pre-made stamps or manually by hand. To acquire a more realistic look stamped concrete patio, stone patterns are hand-stained. Spray Knockdown Finish – This spray down concrete system is often used on pool decks, this coating is perfect for patios because of its subtle texture and heat-reflective surface. 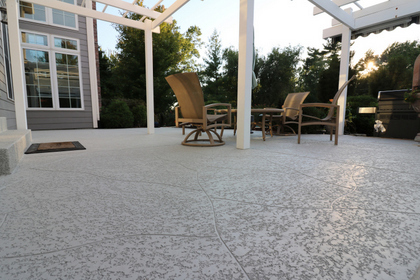 Acquire classy concrete patios without overspending. Call (773)377-8976 now! Chicago Concrete Artisans is a licensed contractor that specializes in resurfacing and refinishing concrete surfaces like patios, pool decks, driveways, interior floors, commercial flooring and more. We understand that you want your outdoor living space to be more stunning and more comfortable to use. We made sure that we have something affordable to offer you, without compromising the need for durable and long-lasting solutions. If you have ideas for back patios or front porches, give us a call @ (773)377-8976 or send us an email. Let’s discuss how we can make that happen for you.